666 Energy drink is a drink/shot hybrid that comes in two flavors; Virgin Sacrifice Cherry and sugar free Lucifer's Lemonade. Satan said swallow! That’s the tag line for 666 Energy’s underworldly new drinks. They offer two flavors, Virgin Sacrifice Cherry (how’s that for a visual?) and Lucifer’s Lemonade. So, can Satan deliver a kick? The distinction between the two flavors is sweetener. Lucifer’s Lemonade is sweetened with Sucralose, and Virgin Sacrifice Cherry is made with cane sugar. I thought the cherry flavor was quite well done and didn’t have the cough syrup taste that most cherry drinks seem to suffer from. The lemonade shot tasted very much like a lemon-lime 5 Hour Energy shot. Both drinks feature 200mg of Caffeine and a blend of B vitamins. Lucifer’s Lemonade has zero carbs or calories, while Virgin Sacrifice Cherry has 124 calories and 31 grams of sugar. Both cherry and lemonade had a decent kick that set in very abruptly. I drank one on the way to the gym and I felt a noticeable lift in energy a few minutes into my workout. I thought the sugar in cherry would cause me to crash, but I was wrong. Both flavors gave me a solid 6 hour energy lift, which is rare for me these days. Sugar content: 31 grams (per 4 ounces). How Does 666 Energy Drink Compare? 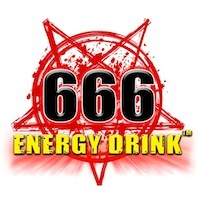 666 Energy Drink contains 50.00 mgs of caffeine per fluid ounce (169.07mg/100 ml).